What if the NCAA tournament wasn’t single elimination? Connecticut just defeated Kentucky to win the NCAA Men's Basketball Championship. 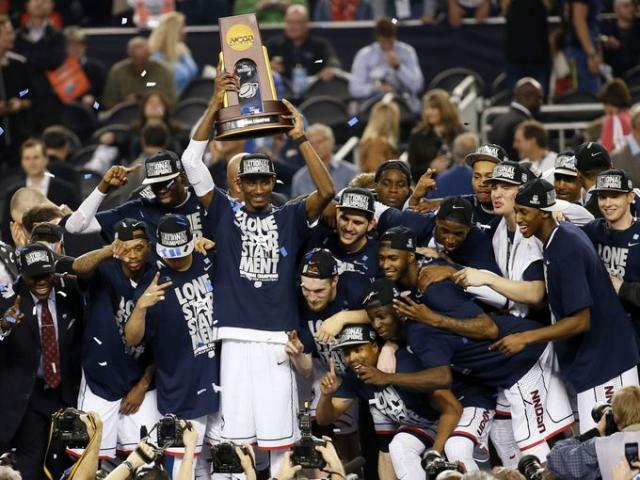 The game had the highest combined seeding of any championship game in NCAA tournament history. This shows that while a single elimination tournament can be very entertaining, it doesn’t always determine who the “best” team is. In fact, despite winning the championship, Connecticut is still ranked 8th in the Pomeroy Ratings and 10th in the Sagarin Predictor Rankings. Though Connecticut played the best basketball the past 3 weeks, it would be folly to ignore the 30 games they played before that! But although I’d agree Connecticut isn’t the “best” college basketball team, they definitely deserved the championship thanks to their dominant wins over Villanova, Iowa State, Michigan State, Florida, and Kentucky. And the funniest part about their run is that the closest they came to losing was against St. Josephs, by far the worst team they played in the tournament. But the point of this post isn’t to rain on their parade. Instead, I want to look at how much the single elimination format helped Connecticut and how different their chances would have been if the tournament was a best of 3, 5, or even 7 game series! First I’m going to look back at Connecticut’s run and calculate their probability of beating each team they faced with a regression model that uses each team's ranking. The rankings I’m using are the final Sagarin Predictor Rankings rather than the rankings before the tournament. The tournament gave us additional information about each team, so we might as well use it! If you multiply all of those probabilities together, you find that the odds of Connecticut winning all 6 of those games are only 2%, or about 1 in 50. Those odds are low, but keep in mind that in a 68-team tournament, the eventual champion’s odds are always going to be low. It’s not easy to win 6 basketball games in a row, but somebody has to do it. And for reference, if I assume Connecticut was the #1 ranked team (instead of #10), their probability of beating those same 6 teams is still only 19%, or about 1 in 5. This is why a single elimination tournament does a lousy job of determining the “best” team. Chances are the best team isn’t going to win! But what would we do if we wanted to devise a tournament that did a better job of determining who the best team was? It’s actually the same thing we would do in quality improvement. Whether we’re trying to determine the best basketball team, the best supplier to buy materials from, or even if the temperature depends on whether Punxsutawney Phil sees his shadow, when we want to be more confident in our decision we should increase the sample size! So in our hypothetical tournament, instead of having just a single game determine the best team, we should use multiple games. To determine how many, I’ll use a negative binomial distribution. The negative binomial distribution models how many trials it will take for a certain event to occur a certain number of times. So if Connecticut has a 77% chance of beating Saint Joseph’s, this distribution can tell us the probability of Connecticut beating them 2 times in 3 tries (a best-of-3 series). The table below compares Connecticut’s probability of beating each team in different variations of a multi-game series. You can see that when the teams are evenly matched, like Connecticut was against Villanova and Kentucky, the extra games don’t change the probabilities very much. The big change in percentages comes when one team is significantly better than the other. In a single game, Saint Joseph’s was more than capable of upsetting Connecticut (and they nearly did!). But the odds tilt very heavily in Connecticut’s favor when you play more games. However, the Huskies can be glad they didn’t have to beat either Michigan State or Florida multiple times. The single game elimination format definitely helped them there! Overall, the odds of Connecticut winning the entire tournament don’t change very much between the different series. The single elimination formatted helped Connecticut a little, but not very much. But let’s get back to that “determining the best team” thing. What would these probabilities look like if we assumed Connecticut was the #1 team? We see that just by making the tournament a best-of-3 series, the #1 ranked team’s chances almost double. And they triple when you make it a best-of-7 series! And with a 7-game series, you’d have the “best” team actually winning the entire tournament most of the time too! Of course, the tradeoff is that there would be significantly fewer upsets. Mercer probably doesn’t beat Duke in a multi-game series and Dayton almost certainly isn’t beating both Ohio State and Syracuse. March Madness would have to be replaced with March Monotony. So don’t take this as a criticism of how the NCAA tournament is currently constructed! The tournament is unpredictable and entertaining, and that counts for something, too! And having 67 multi-game series wouldn’t be feasible anyway. But all jokes aside, the NCAA tournament is unlikely to have multi-game series anytime soon. So continue to enjoy the tournament in its current form. Just know that when you hear somebody say that the team that won the championship is the “best” team in college basketball, you should take it with a grain of salt. After all, if the better team always won, it wouldn’t be March Madness, would it?